PIL Gold Property | Finlay Minerals Ltd. The PIL Property, Finlay’s largest holding, is situated in north-central British Columbia; it is 100% owned by the Company and consists of a contiguous block of 48 tenures covering 17,006 hectares (170 km2). The PIL is situated in the Toodoggone mining district, a mineral-rich belt that hosts numerous porphyry copper-gold (Cu-Au) and epithermal gold-silver (Au-Ag) deposits. The property lies east of the former Baker Au-Ag mine (Sable Resources) and 35 km northwest of the former Kemess copper-gold open pit mine. Over the past 18 years, Finlay has made numerous discoveries of porphyry copper (Cu) and epithermal Au-Ag type occurrences at the PIL. The PIL Property encompasses several distinct areas of mineralization; these include from north to south: the NW, Silver Ridge, NE, WG, Central, Gold, Atlas, Pillar East and PIL South Zones. Several large, visually prominent rusty zones (gossans) were explored by geochemical and geophysical surveys followed by diamond drilling (2003-2007). One target, the Northwest Zone, yielded promising drill results with three holes ending in copper-molybdenum mineralization at relatively shallow depths (< 350m). In 2004 the Toodoggone region was the subject of a multi-sensor airborne geophysical survey. Similar surveys over BC porphyry copper deposits such as Afton and Mt. Milligan have yielded positive results. Radiometric (Potassium, Thorium/Potassium – Th/K ratio) and magnetic data are useful in finding potassic alteration and magnetite enrichment or depletion zones associated with porphyry deposits. When viewed on the 2004 Toodoggone airborne survey it is evident that the Atlas and Pillar East Zones are situated on the flank of a 1 to 2 km wide Th/K anomaly, one of the largest of the entire survey. A smaller but distinct Th/K anomaly is also associated with the NW Zone. The coincidental association of a large Thorium/Potassium anomaly, the Atlas East and Pillar East epithermal Au-Ag zones, Copper Cliff hypabyssal monzonite and granitic clasts in copper mineralized breccia dikes are potentially related to the effects of a large, deep seated alkalic porphyry system. The concept for future exploration include detailed geology and alteration mapping, prospecting, deep IP surveys and deeper drilling to test for porphyry copper and epithermal gold-silver potential. outcrop and talus sample grades are comparable or better than most BC operating copper mines. Over the past several years, the exploration industry has successfully used geological and geophysical data to locate larger, deep-seated “feeder” porphyry systems. These mineralized zones are being found beyond the depths of historic deposits, as well as at former and currently operating mines. At a number of projects and mines drilling to depths in excess of 1,000 metres is common. Based upon this, the Company believes that some of the PIL property porphyry targets warrant deep induced polarization (IP) surveys and deeper diamond drilling. In August 2016, the Company completed a program of prospecting along with rock, soil and stream sampling in the Pillar East Zone, the site of two new mineral discoveries. The program’s objective was to follow-up on evidence of an epithermal gold-silver (Au-Ag) zone and a nearby zone of alkalic-porphyry related copper (Cu) and silver (Ag) mineralization. The results of this work were very positive and amply justify the Company moving forward to aggressively explore these exciting new mineral discoveries. In 2017, an airborne magnetic survey, an Induced Polarization (IP) survey, geological mapping and soil, stream and rock sampling were completed. Geological mapping interprets the Copper Cliff as Cu-Ag mineralization associated with the contact zone of hypabyssal (shallow depth) monzonite bodies. In the Toodoggone region porphyry deposits are spatially and genetically associated with Jurassic age Black Lake intrusives, related volcanic rocks and older Takla Group volcanics. Black Lake intrusive rocks are present at Pillar East, the NW Zone and elsewhere on and around the property. A quartz breccia sub-crop sample recently collected along the trend of the Epithermal Au-Ag Zone grades 19.95g/t Au, 423g/t Ag. This is 40 metres south of a 2016 discovery of a 0.5 metre quartz breccia boulder assaying 6.56g/t Au and 13.1g/t Ag. With the completion of the 2017 program, prospecting, soil and rock sampling has traced a north-northeast trending Epithermal Au-Ag Zone for 800 metres. Results of this work were reported in Company news releases (April 29 and October 25, 2016). An unusual breccia dike 1.5 km westerly in the Atlas Zone containing granitic fragments not mapped in the area was re-examined. A selected grab sample of the dike with suspect chalcocite (copper mineral) assayed 2.76% Cu and 52g/t Ag. The 2017 IP survey identified a general increase in chargeability values culminating at a chargeability anomaly on the eastern margins of the survey and beyond the property boundary. A weak chargeability anomaly is visible at the southern portion of the epithermal Au-Ag zone and just north (below) the Copper Cliff Zone. The well-defined anomaly dips at roughly 45° and extends for some 200 metres. A sharp resistivity boundary is seen at depth directly below the chargeability anomaly which correlates with a small, discreet magnetic high within a larger circular magnetic feature. The Atlas Zone is evident as a 500m + wide rusty, clay-silica gossan. Exploration identified the presence of epithermal Au-Ag mineralization. Prospecting discovered outcrop and float quartz veining, breccias and silicified volcanic rocks. Sampling has yielded 31 rock samples grading >1g/t Au and 5 samples >10g/t Au. 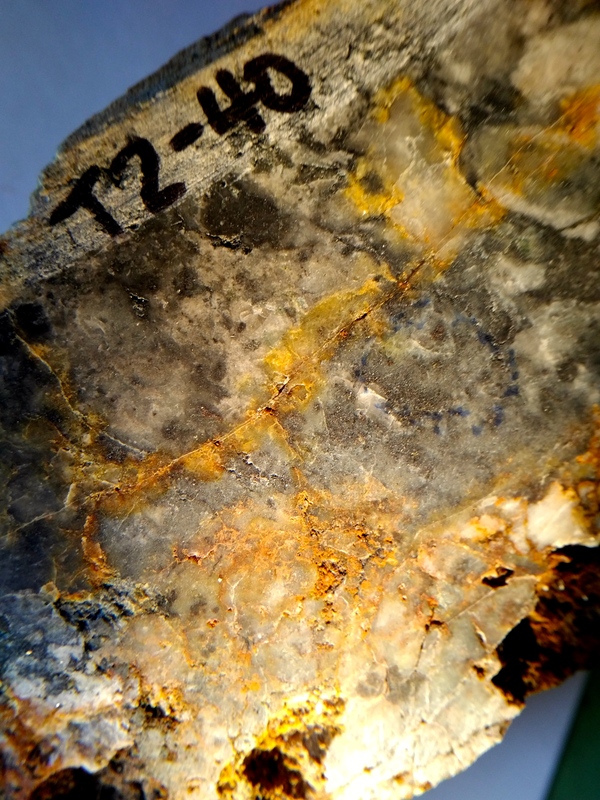 High-grade mineralization has been found exemplified by a silicified breccia sample with visible electrum and argentite that assayed 489.7g/t Au and 6,514g/t Ag. The source(s) of this mineralization are local. Drilling intersected silicified volcanics and localized quartz stockwork veining with visible electrum and argentite and electrum in four drill holes. Significant drill intercepts include 8.40 metres grading 2.18g/t Au and 28.4g/t Ag (Hole A06-05), 5.95 metres grading 2.12g/t Au and 113.5g/t Ag (Hole A06-12) and 14.0 metres grading 2.48g/t Au and 42.7g/t Ag (Hole A07-03). Road based drilling prevented the testing of the Atlas zone from some preferential sites. Exploration one kilometre east resulted in the discovery of highly Au-Ag anomalous soil and rock samples (the Pillar East Zone). Panning of several stream samples and rusty outcrops revealed angular gold. Follow-up work in 2015 and 2016 identified epithermal Au-Ag mineralization and intrusion and volcanic hosted Cu-Ag mineralization (Copper Cliff Zone). The “Company completed a 10-day hand trenching program conducting channel sampling of significant epithermal gold-silver mineralization at the PIL property in the Toodoggone region of northern BC. The work focused on determining if the NNE-oriented, 800m long soil, stream sediment and rock sample anomalies were related to a single structure (vein), or possibly a stockwork system of veins and breccias of economic potential. Galena (Pb), sphalerite (Zn) and chalcopyrite (Cu) present in many of the new zones. Sample analysis was performed by Bureau Veritas Commodities Ltd. in Vancouver, BC. Multi-element analysis utilized aqua regia digestion and ICP-MS methodology (AQ201). Samples greater than (>) 10g/t Au and >100g/t Ag were re-analyzed by Method MA404 using 4-acid digestion and AAS finish. Quality assurance/quality control (QA/QC) consisted of the insertion of an analytical reference standard for every 20 samples. (Click HERE for individual trenches, sample locations and geology). The Company notes that the trenching at the Pillar East epithermal Au-Ag system uncovered variable-oriented mineralized veins and breccias scattered across an ~100m width, lending credence that the soil anomaly breadth is not just related to down ice dispersion but to a vein / breccia / stockwork system. The next step is to continually sample across the epithermal system to understand vein / breccia / stockwork density and tenor of mineralization. T14-02: 0.6g/t Au, 27.2 g/t Ag, 327 ppm Cu, 1,840 ppm Pb & 5,482 ppm Zn. It is evident from geological observations and geochemical data that structures may play a significant role in the emplacement of intrusive rocks and Au-Ag mineralization on this area of the PIL property. Regional and local geological mapping reveal west-northwest and northerly oriented structures. Such orientations have been observed along the Pillar East epithermal trend. Prospecting, geochemical and geophysical surveys to date have identified volcanichosted Cu-Ag mineralization (Copper Cliff Zone) and epithermal Au-Ag mineralization at the Pillar East Zone. The Company believes that collectively, the Pillar East Au-Ag Zone, the Copper Cliff Cu-Ag Zone immediately south, the nearby Atlas East epithermal Au-Ag Zone and the presence of granitic clasts in copper mineralized breccia dikes proximal to a very large airborne Thorium/Potassium anomaly are potentially related to a large, deep-seated porphyry system. No deep drilling has ever been conducted at any of the PIL Property mineralized zones. In 2015 abundant chalcopyrite and malachite (copper minerals) were found in volcanic rocks on a large talus slope near the southern part of the epithermal Au-Ag zone. Four composite rock samples collected from the talus slope returned 0.99% to 1.67% Cu and up to 33.8 g/t Ag. 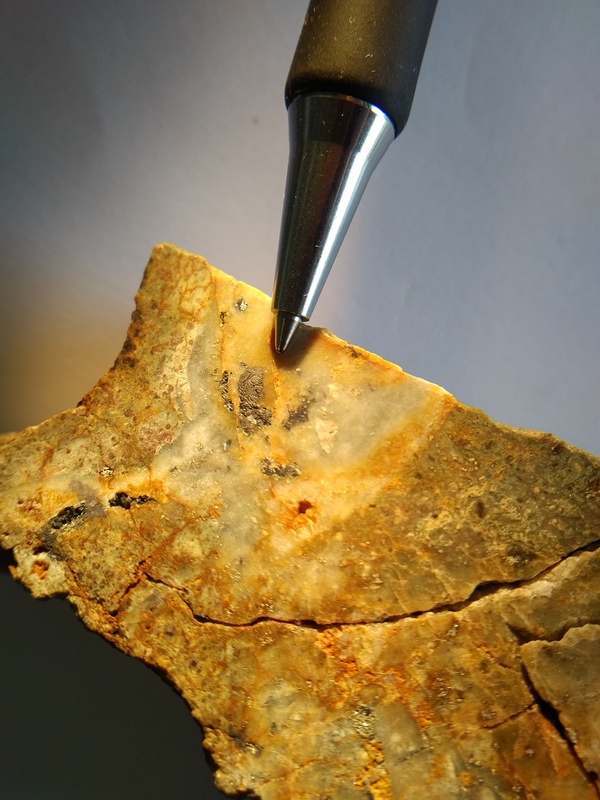 Petrographic analysis in 2015 described a talus sample as strongly altered (chlorite-quartz-carbonate-sericite) felsic/alkalic lapilli tuff (fragmental volcanic rock) with abundant fine-grained chalcopyrite-hematite mineralization. A very significant development of the 2016 program was the discovery of copper mineralized alkalic-porphyry monzonite bedrock uphill of the talus samples collected in 2015. Copper mineralization in bedrock extends at least 40 meters east-west by 30 meters north-south. Visual indications of malachite on steep rock faces to the east and the copper mineralization on the large talus slope below and to the north indicates that the Copper Cliff Zone is larger. Therefore, the full extent of this new zone of copper mineralization is yet unknown. Of eleven rock samples collected (continuous outcrop chip and composite base of cliff talus samples) all contain disseminated chalcopyrite mineralization. Copper and silver assays range from 0.05% to 1.04% Cu and 2.8 to 23.9g/t Ag respectively from a potassic altered low-iron (Fe)/high copper (Cu) hypabassal monzonite porphyry with abundant chalcopyrite. The concentration of chalcopyrite in some areas exceed 5%. 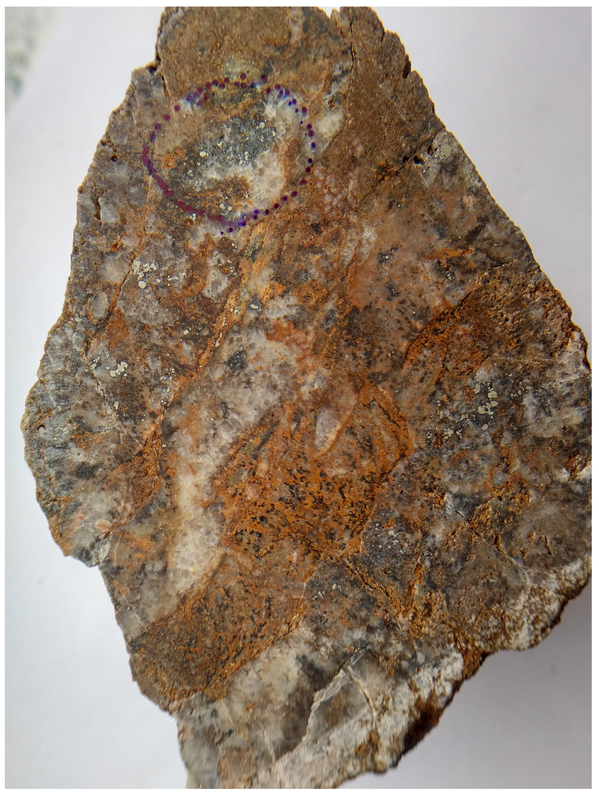 Petrographic analysis of sample W16R-30 in 2016 describes the rock as a hypabyssal (shallow depth) feldspar ± biotite porphyry of about monzonite composition. 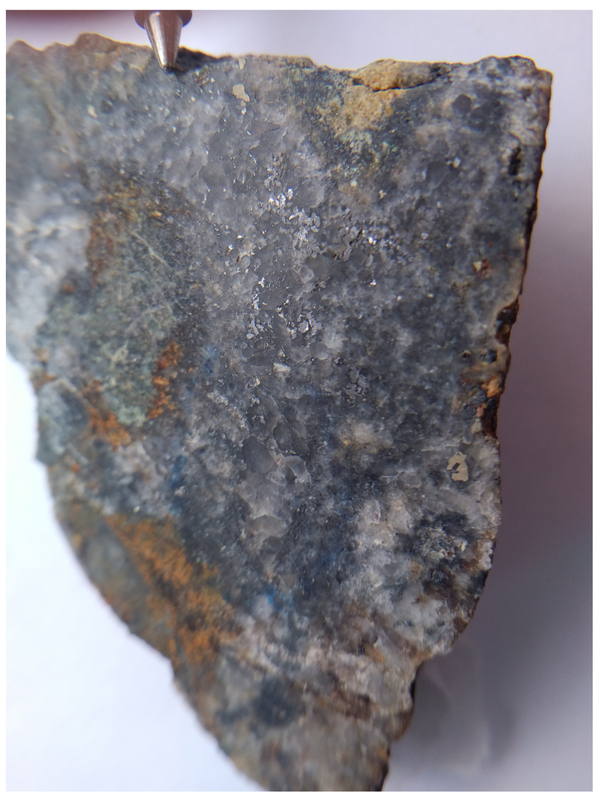 It is cut by strongly developed stockwork of chalcopyrite-minor bornite-pyrite veinlets associated with quartz, alkali feldspar suggesting this is alkaline porphyry copper-type mineralization in a low iron/high copper system. Interestingly the petrographic descriptions of Copper Cliff rocks suggest that magnetite is absent or altered to hematite. These results are very encouraging as they describe a new and previously unrecognized type of copper mineralization occurring in high level intrusive and related (co-magmatic?) volcanic rocks. The presence of intrusive rocks at Pillar East is considered very significant. In the Toodoggone region, porphyry copper mineralization is spatially and genetically associated with intrusive rocks, their co-magmatic (related) volcanics and adjacent volcanics such as the Takla Group (i.e. Kemess). At Pillar East, a small body of Early Jurassic age Black Lake diorite is mapped by the BC Geological Survey near the northern portion of the epithermal Au-Ag zone. In addition, a breccia dike found in 2006 approximately 1.5 km west-northwesterly in the Atlas East Zone contains fragments of granitic rock and copper mineralized volcanics. This could indicate that geologically prospective intrusive rocks underlie the Pillar and Atlas Zones. Previous multisensor surveys over similar BC porphyry type copper deposits such as Afton and Mt. Milligan have yielded positive results. Radiometric (Potassium, Thorium/Potassium ratio) and magnetic (total field and calculated vertical gradient) maps are particularly useful in identifying potassic alteration and magnetite enrichment/depletion zones associated with these porphyry deposits and in mapping bedrock lithologies and structures. The Pillar East mineralized zones when plotted on the airborne survey maps coincide with distinct geophysical features. On the magnetic calculated vertical gradient map, the mineralized zones occur proximal to a magnetic low centered within a prominent, nearly circular two-kilometer diameter magnetic high. This may reflect magnetite destruction resulting from 1) hydrothermal effects of the epithermal Au-Ag zone and 2) alteration of the hypabyssal intrusive and adjacent volcanics associated with the Copper Cliff Zone. The 2016 exploration objectives were to further trace and sample epithermal style precious metal mineralization first identified in 2006-07 by highly anomalous gold and silver (Au, Ag) in soil, silt and rocks 1.5 km east of the Company’s Atlas East epithermal Au-Ag zone. Some of the most anomalous soil samples from the 2007 work assayed >1.0g/t Au with one containing 6.75g/t Au. Panning of rusty, crumbly surface material from a small outcrop revealed very fine-grained, angular gold suggesting a local bedrock source. Similar angular gold was also panned from creeks several hundred meters to the north-northeast. In 2015 the rusty outcrop was tested with a three meter, steeply angled drill hole. All but one sample (wall rock) returned strongly anomalous gold and silver (results reported in April 29, 2016 news release). Angular talus fragments of rusty, epithermal style quartz collected 25 meters north of the 6.75g/t Au soil returned 8.3g/t Au and 39.7g/t Ag. The 2015 work concluded that this mineralization represents a volcanic hosted, north-northeast trending and steeply dipping epithermal structure nearly 500 meters long and of indeterminate width. Work in 2016 tested many of the strongest gold-in-soil and rock sample anomalies from the previous programs. In virtually every case anomalous gold-in-soil was confirmed by evidence of quartz veining, stockwork or quartz breccias. Close spaced soil samples collected across the gold anomalies returned from background to 2.88 g/t Au. Of the ten soil samples containing >0.1g/t Au, nine yielded from 1.1 to 50.3g/t Ag with one soil sample assaying 232g/t Ag. Twelve of the sixteen rock samples collected during the follow-up work returned anomalous Au and Ag ranging from background to 6.57g/t Au and background to 69.7g/t Ag respectively. Many of the most anomalous soil and rock samples also contain significant amounts of lead (Pb) and zinc (Zn) with some rock samples occasionally grading over 0.5% combined Pb-Zn. To date the geological and geochemical evidence and data indicate that the Pillar East Epithermal Au-Ag Zone is approximately 800 meters long and of unknown width. It is open along strike with the possible strike extensions especially to the south obscured by talus. Given the positive exploration results, the Company anticipates continued work and plans more extensive exploration including further prospecting, sampling, mapping, Induced Polarization (IP) geophysical surveys and ASTER satellite imagery of these new mineralized zones. The results of this work will help define future drill targets. Warner Gruenwald, P.Geo. and Vice President, Exploration for Finlay Minerals Ltd. is the Qualified Person as defined by National Instrument 43-101 and he supervised the exploration work and has prepared the above material. Sample analysis was conducted by Bureau Veritas (formerly Acme Labs.) in Vancouver, BC. Seven rock samples reporting >4,000 ppm (0.4% Cu) were re-analyzed by Bureau Veritas using method MA401, a multi-acid, ore grade classical wet assay method that utilizes a four acid digestion followed by an Atomic Absorption Finish. Bedrock grab sample of silicified and quartz veined andesite. Random chip across 14m of silicified and stockwork veined andesite subcrop and talus. Selected sample of silicified breccia with native gold, electrum and argentite. Composite grab sample of vein float up to 10 cm, locally containing native gold and argentite. Drilling in 2006 intersected significant precious metal mineralization in three holes. Two of these contained visible gold and argentite. 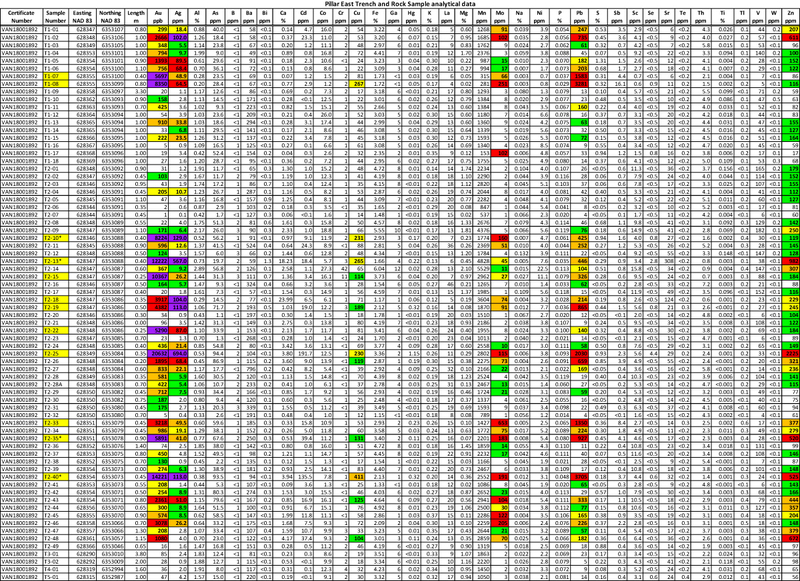 The following table highlights the drilling results. In late 2006 stream sampling east of the Atlas East exploration area yielded gold concentrations much greater than that found downstream of Atlas East. This discovery expands the east-west exploration potential to nearly two kilometers. Follow-up sampling in 2007 indicated the possible presence of a gold-silver mineralized system. This new area has become referred to as the Pillar East Zone. Interestingly the 2004 Toodoggone airborne survey reveals the Atlas East Zone to coincide with the north boundary of a very large thorium/potassium anomaly nearly three kilometers across. Such anomalies have been demonstrated to signify alteration potentially associated with mineral deposits. Work by the Company from 2005 to 2007 identified the Atlas East Zone as a new epithermal gold-silver exploration target. Native gold and silver sulphides (argentite) along with minor amounts of chalcopyrite, galena and sphalerite occur in bedrock and float. Bedrock samples grading up to 33 g/t gold and 482 g/t silver and quartz vein float grading up to 72.5 g/t gold and 2,187 g/t silver were discovered in 2005. In 2006 brecciated and silicified bedrock yielded 489 g/t gold and 6,514 g/t silver and quartz vein float grading to 72.5g/t gold and 2,187 g/t silver have been discovered. All mineralized float is considered to be very near the bedrock source. Mineralization occurs in silicified zones, quartz stockwork veining, and breccia associated with a prominent gossan hosted by pyritic andesite (see Atlas East photo). Drilling in 2004-2005 identified porphyry significant copper-molybdenum mineralization in the NW Zone. In 2004, drill hole PN04-09 intersected approximately 300 metres of mineralization with a 168 metre interval grading 0.09% copper (Cu) and 0.004% molybdenum (Mo). Mineralization is associated with silicified, variably quartz veined and brecciated quartz diorite and monzonite that has thus far been traced over an area of 400 by 400 metres. In 2005, drill holes PN05-01, 02, and 09 were drilled as step out holes aimed at testing the extent of the mineralization. The farthest step out holes (PN05-02, 09) located 300+ m from PN04-09 intersected mineralization. Hole PN05-02 intersected 65.1m grading 0.140% Cu and 0.004% Mo while PN05-09 intersected several zones with 155 metres containing 0.064% Cu and 0.002 % Mo. Interestingly, the last 1.70 metres of the hole contains 0.154% Cu, 0.013% Mo along with 88 ppm tungsten, and 0.46% zinc. The NW Zone is open to the north, west and to depth. In 2006 two holes (PN06-01, 02) were drilled the first of which tested the area west and beneath Hole PN05-02. The second hole targeted the western and possibly down dropped portion of the NW Zone along a prominent north-south fault zone. Hole PN06-01 intersected 34 metres of very altered and pyritic intrusive rocks containing anomalous copper within which 16 metres grades 3.2 g/t silver. PN06-02 ended in a prominent tectonic breccia likely representing a major fault. Deepening of these holes is planned. 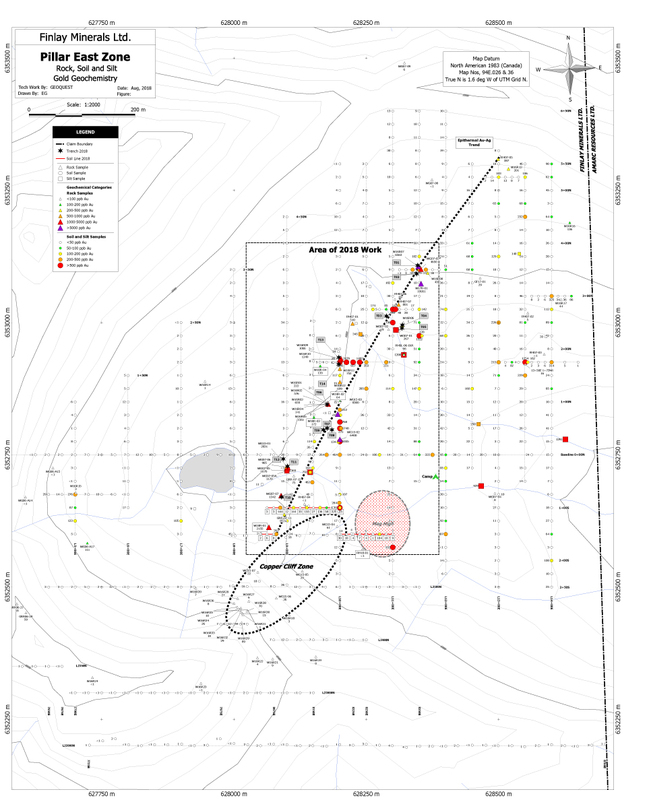 Exploration has revealed the Silver Ridge Zone is a north-northwest trending structural feature manifested by a five kilometer long by 500-metre wide silver-gold-lead-zinc soil geochemical anomaly. Electromagnetic surveys and mapping reveal the zone comprises of a series of parallel shears and silicified zones many of which are mineralized. In 2004 a significant mineralized zone was encountered in the Silver Ridge Zone where drill hole PN04-06 yielded a 2.4 metre core length containing 1,235 g/t silver along with anomalous amounts of copper, tungsten and zinc. This intersection came from the end of the hole that was terminated due to technical difficulties in a zone of highly fractured rock. Similar lower grade mineralization was also intersected in two holes situated 0.8 and 1.95 km north-northwest respectively. In 2005 the high-grade silver mineralization intersected in hole PN04-06 was tested by a twin hole - PN05-10. This hole yielded a 2.30-metre interval grading 6.8 g/t silver associated with a shear zone and a 7.60-metre interval containing 1.05 g/t gold. Most of this hole contains anomalous tungsten and zinc, a geochemical signature commonly seen along the Silver Ridge Zone. Extreme technical difficulties due to a very unstable fault zone did not allow the completion of the hole. Also during 2005 in an area referred to as the Silver Ridge North Zone, drill hole PN05-03 tested a strong gold and silver soil anomaly. The hole intersected a shear zone with 2.0 metres grading 1.47 g/t gold and 57.5 g/t silver. At increasing depth, the hole intersected zones up to 68 metres wide consisting of strongly altered and pyritic intrusive rocks (halo?) that grade with depth into silicified and brecciated monzonite. A 60.3-metre section near the bottom of the hole contains sporadic, anomalous copper along with 24 ppm tungsten and 0.13% zinc. It was apparent that PN05-03 intersected Silver Ridge type mineralized structures but unexpectedly bottomed in what appears to be a mineralized porphyry system. Drill hole PN05-08, a 100-metre southerly step out from PN05-03, bottomed in similar, but less extensive, tungsten-zinc mineralization. The halo of very altered rocks encountered in both holes and the underlying tungsten-zinc mineralized intrusive rocks may be evidence of a deeper or lateral expression of a porphyry system. Drilling is proposed to determine whether Silver Ridge North and the NW Zones are part of a much larger porphyry system. The PIL South Zone is underlain by Takla and Toodoggone volcanics as well as Black Lake intrusives. Mineralization on PIL South consists of 1) widespread quartz vein and veinlets containing various combinations of copper, gold, zinc, lead and silver mineralization 2) disseminated sulphides, comprised of a few percent pyrite with traces of copper minerals, containing copper and zinc ranging to hundreds of ppm and gold in the tens of ppb. This disseminated sulphide mineralization, while not approaching ore grade, is a favourable indicator that a porphyry-style mineralizing system may exist at PIL South. In 2003 a drilling program of four holes (707m) was conducted with the target being coincident geochemical and geophysical anomalies. Drilling did not encounter porphyry copper mineralization however not all holes were able to achieve their target depth. The initial hole drilled to 400m intersected propylitic alteration (pyrite halo) of quartz veins with pyrite, hematite, magnetite, potash feldspar and minor chalcopyrite in Talka metasediments. This is surmised to represent a “pyrite alteration halo” around a deeper alkali porphyry source. In 2004 Finlay conducted grid based soil sampling, geological mapping, rock sampling and an IP survey. Soil sampling outlined a 300 by 600 metre gold anomaly. The Gold zone mineralization is hosted by vuggy quartz-silica zones that may represent a “low-sulphidation epithermal zone”. The Gold zone is underlain by Toodoggone volcanics that elsewhere in the district host gold-silver epithermal mineralization (i.e. Baker and Lawyers deposits and the Atlas occurrences). During the period 1968 through 1987, several operators explored mineral claims that included parts of what is now the PIL Project. From 1992 through 1998 Electrum owned and explored the PIL Property. Exploration work from 1968 through 1998 included geochemical and geophysical surveys, minor hand trenching and geological mapping. Finlay acquired the PIL Project from Electrum in 1999 and has since conducted extensive grid based soil and geophysical surveys, geological mapping, constructed access roads and drilling. Since 2003 the company has completed 42 drill holes totaling 9,665 meters. Cordilleran Engineering drilled two holes in the northwest part of the PIL property. Cominco explored a copper porphyry target on the south part of the PIL property. Serem Ltd. conducted detailed stream sediment and contour soil sampling with exploration culminating in hand trenching an epithermal gold-silver prospect (now called Atlas West). Electrum Resources Corp. acquired the PIL claims and began a long and methodical period of prospecting, stream/soil/rock sampling, prospecting, and limited geophysical surveys. Finlay Minerals purchased the property and conducted a major exploration effort including IP and magnetic surveys, soil/rock sampling and detailed geological mapping. Rock sampling and hand trenching on the PIL South area. Work focused on PIL North area with the completion of 8.3 kilometers of induced polarization (IP) and magnetic surveys, soil and rock sampling, and geological mapping. Continued exploration efforts on PIL North with the completion of 13.1 kilometers of IP and magnetic geophysical surveys soil and rock sampling, trenching and geological mapping. In late 2002, the WG Zone, a lead-zinc silica-barite occurrence was discovered and explored by hand and blast trenching. Finlay Minerals completed a helicopter supported drill program consisting of four holes (707m) targeting geophysical and geochemical anomalies in the PIL South area. IP and soil sampling surveys conducted over 16.6km of grid on the Pil North area. Quartz float with visible gold and grading 16.8g/t discovered 1 km east of the WG Zone. Construction of a 7.5 kilometer access road, a fully serviced camp and 13.9 kilometers of drill access roads, geological mapping and prospecting. A reconnaissance diamond drilling program of 26 holes totaling 6,168 meters focused on five separate zones defined by geochemical and geophysical surveys. Prospecting resulted in the discovery of large (1m+) gold - silver bearing boulders 800 meters east of the Serem (Atlas West) trenches. This new discovery is called the Atlas East Zone. Fill-in soil sampling was conducted on the existing grid from the Silver Ridge Zone to the NW Zone. Magnetic and electromagnetic (VLF-EM) surveys were conducted over the Silver Ridge, Silver Ridge North and NW Zones. Stream sampling follow-up of historic anomalies was completed. Detailed soil and rock sampling completed on the Atlas East Zone identified numerous float and bedrock occurrences of epithermal gold and silver mineralization. Twelve diamond drill holes totaling 3,090m were completed on the NW, Silver Ridge, and Atlas East Zones. Constructed access road to Atlas East and West Zones. Grid based soil, magnetic and VLF-EM surveys over a portion of the Atlas zones along with geological mapping and prospecting. Fourteen diamond drill holes (1945m) completed with twelve drilled on the Atlas and two on NW Zones. 2007: Work consisted of grid based soil sampling, stream sampling, road building, geological mapping, prospecting and diamond drilling. A total of 2,408 meters of drilling was completed in seven holes. Soil sampling further east into the headwaters of another drainage yielded the highly anomalous values ranging up to 6,748 ppb gold with six samples containing >1,000 ppb. Stream sampling yielded highly anomalous gold at six sites with values ranging up to 2,210 ppb Au. Visible gold was panned at three stream sample sites. At one site hackly, bright yellow gold was found with attached quartz suggesting a very local source. Follow up on several geochemical anomalies to the east of Atlas East lead to the discovery of the epithermal Au-Ag mineralization, and float of copper mineralized tuffs. This area is now referred to as Pillar East. The focus of the 2016 work program was to expand the epithermal Au-Ag foot print, and to further investigate the copper mineralization, leading to the discovery of porphyritic monzonite (alkali) intrusion with Cu-Ag mineralization in outcrop (Copper Cliff). Exploration in the region dates to the early 1900s during the search for placer gold prompted by placer gold discoveries in the Germansen, Manson Creek and McConnell Creek areas. Intensive exploration in the region commenced in the late 1960s, by Cominco and Kennco Exploration on numerous large gossanous zones representing epithermal and porphyry copper-gold targets. These and the PIL property are situated within a region of mineral prospects and mines known as the Toodoggone mining camp. Exploration activity peaked through the late 1970s and the 1980s and culminated in the construction of the Baker and Cheni gold-silver mines. In the early 1990s the Kemess property (Cu-Au alkali porphyry deposit) was acquired by Royal Oak Mines and brought into production in 1998. The bulk tonnage, open pit Cu-Au mine operated under several owners until 2011. Presently AuRico Metals Inc. is exploring several bulk tonnage, underground mining deposits at the Kemess Underground and Kemess East sites. Regionally the PIL property is situated in the Quesnel Terrane, a nearly 1,000 km north-northwest trending belt of rocks comprised of Mesozoic volcanics and alkaline intrusive rocks. It extends from near the British Columbia - United States border northerly though the Toodoggone region and beyond. The Quesnel Terrane hosts numerous alkali composition porphyry Cu-Au-Ag mines and prospects including Copper Mountain (Copper Mountain Mining), New Afton (New Gold), Mount Polley (Imperial Metals), Mount Milligan (Centerra Gold) and recently commissioned Red Chris Mine (Imperial Metals). The Toodoggone region is defined as a 90 km long by 15 km wide northwest trending belt of early Jurassic diorite, granodiorite or monzonite phases of the Black Lake Intrusive Suite together with coeval Toodoggone Formation calc-alkaline volcanics. These rocks extend northerly from the Kemess mine area to Chukachida River north of the PIL property. Toodoggone rocks unconformably overlie sedimentary and igneous arc rocks of the Permian Asitka and Upper Triassic Takla groups, which are in turn unconformably capped by Cretaceous continental sediments of the Sustut Group. Toodoggone Formation rocks have not been folded, but due to extension accompanied by rifting and tilting they now dip gently to moderately westward. Structurally the district is dominated by block faulting and half-graben tectonics which was an important controlling feature on the emplacement of the plutons, the eruption of the Toodoggone volcanics and the various styles of Cu-Au or Au-Ag mineralization. Geologically the PIL property is situated within the eastern margin of the Intermontane Belt, a northwest trending assemblage of Paleozoic to Tertiary sediments, volcanics and intrusions covering an area of 90 by 25 kilometers. The district comprises Early Jurassic Hazelton Group rocks represented by the Toodoggone Formation calc-alkaline volcanics, as well as coeval plutonic and sub-volcanic intrusive rocks (Black Lake Intrusions). Toodoggone rocks exceeding 2,200 metres in thickness unconformably overlie submarine sedimentary and igneous arc rocks of the Permian Asitka and Upper Triassic Takla Groups, which are unconformably capped by Cretaceous age continental sediments of the Sustut Group. Structurally the district is dominated by steep dipping block faulting and half-graben tectonics that defines a prominent northwest trending structural fabric. These structures are important controls in the emplacement of the plutons and the eruption of the Toodoggone Formation volcanics. The faults also localized epithermal gold and silver mineralization such as at the Lawyers deposit and the Baker Mine. A number of porphyry copper-gold deposits, including the Kemess South Mine and the Kemess North deposit are related to the Black Lake intrusive rocks. On the PIL property mapping (R. Brown, G. Ray, et al) indicates that most of mineralized zones are predominantly underlain by altered monzonitic and dioritic rocks of the Black Lake Intrusive Suite. Most of these zones occur within large rusty zones or “gossans”. The Atlas East Zone is underlain by Toodoggone volcanic rocks, however, there is evidence of nearby and possibly underlying intrusions. The PIL South Zone is underlain by Takla and Toodoggone volcanics as well as Black Lake intrusives. The property is dominated by structures related to the northwest trending “Pillar Fault”. Splay and conjugate structures occur throughout the property.